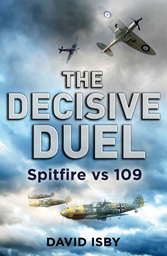 I used this as a source for research for my book THE DECISIVE DUEL: SPITFIRE VS. 109, a “dual biography” of the British Supermarine Spitfire and the German Messerschmitt Bf 109 fighter aircraft of the Second World War. I found it accurate and thoroughly researched (2,000+ footnotes). As I was using many of the same sources myself, I was able to assess the quality of the underlying research as well as the author’s conclusions. Those conclusions are particularly valuable because the book complements rather than duplicates the too-little work that has been done on this subject since the US Strategic Bombing Survey, done while the rubble was still smoldering. The closest comparison is with Lutz Budrass, Flugzeugindustrie und Luftrüstung in Deutschland, 1918-1945 (Düsseldorf: Droste Verlag, 1998) but it is different in approach and emphasis (we still need an English translation of Budrass, please). But while Budrass focuses on the pre-war rise of the industry and offers a case study on the Ju 88, this book concentrates on the industry’s wartime adaptation. His case study, of the design and production of the He 162, makes a good book-end with Budrass’ on the Ju 88. Nor does the book aim to duplicate the type-by-type summaries of Ferenc A. Vajda and Peter Dancey, German Aircraft Industry and Production, 1933-1945 (Warrendale, PA: SAE International, 1998). This book is recommended for anyone with a serious interest in the Luftwaffe and German wartime aircraft. There remains a lot more of the story to be told. I hope someone else will write a book on this subject that uses the FD microfilm files held by the Imperial War Museum as well as this book has used their counterpart sources in Washington and Freiburg.